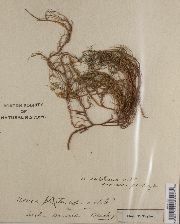 Thallus: erect-shrubby, subpendulous to pendulous, up to 30 cm long, coarse to slender, stiff to flaccid branching: isotomic- to anisotomic-dichotomous, divergent to parallel basal part: concolorous to the branches, often with a brownish-orange pigment, sometimes brownish-black pigmented at the very base branches: cylindrical to irregular; lateral branches: narrowed or not at point of attachment segments: terete to ridged, cylindrical to ±sausage-like; foveoles and transversal furrows: absent to frequent papillae: nearly absent to frequent especially on main branches, low and indistinct to verrucous tubercles: sparse to numerous, conspicuously raised, at first eroded and white at summit, then bursting to form ulcerose soralia fibercles: absent fibrils: nearly absent to numerous, spinulous (1-3 mm) to long (up to 10 mm), irregularly distributed soralia: nearly absent to numerous, sometimes covering completely the apices, located mainly on young branches or fibrils, arising mainly on the tubercles, plane to convex, frequently capitate isidiomorphs: few to numerous, tufted on soralia pseudocyphellae: absent cortex: thick (6-10%), shiny to vitreous, hard, smooth to densely cracked medulla: thick, dense to compact, rarely loose, pink to wine red pigmented, sometimes not pigmented at all axis: thick, white to pink or yellow pigmented Apothecia: not seen in the area Spot tests: K+ yellowish, C+ yellow, KC+ yellow, P- Secondary metabolites: diffractaic acid (major), barbatic acid (minor), ±4-O-demethylbarbatic acid (minor), ±several accessory substances and fatty acids. Substrate and ecology: coastal to montane areas, mainly on bark of Pinus spp. or sometimes Quercus spp. in low forests on exposed ridges between 200 and 450 m or at high altitude in the mountains of the Sierra Madre Occidental World distribution: Eurasia, eastern, western and south eastern North America, and South America Sonoran distribution: southeastern Arizona, southern California including the Channel Islands, Chihuahua and Sierra Madre Occidental of Sinaloa. 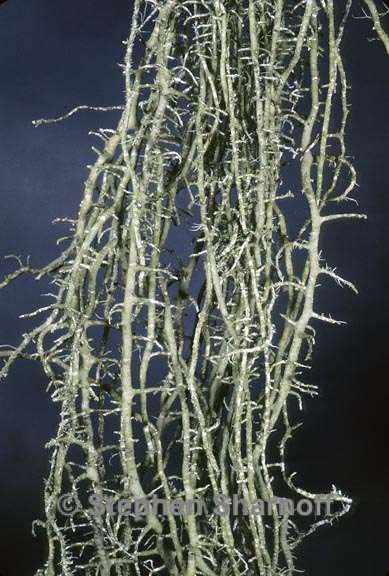 Notes: Usnea ceratina is characterized by its tuberculate soralia, its vitreous cortex, its ± pinkish pigmented and compact medulla, its pale base sometimes with a yellowish hue and its production of diffractaic and barbatic acids in the medulla that reacts C+ yellow.